These do have associated uses, such as inflating the canopy first and then only when one is ready for take, starting the engine. Terminating the engine in the air and then flying as one would in conventional paragliding has it's advantages, however the carburetor may need re-priming if the engine has been off for an extended period of time. Normally with the engine on idle, you can still hear your flight instruments quite sufficiently. (Just give it rev. every now and again, else the plug may oil up and then it cuts out just when the accelerator is squeezed). 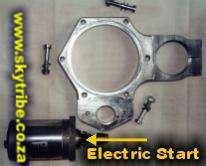 Just remember with electric starts there is the associated weight of the starter unit and a small 12V battery.